Canadian Vineyards have grown a following in the past few years. 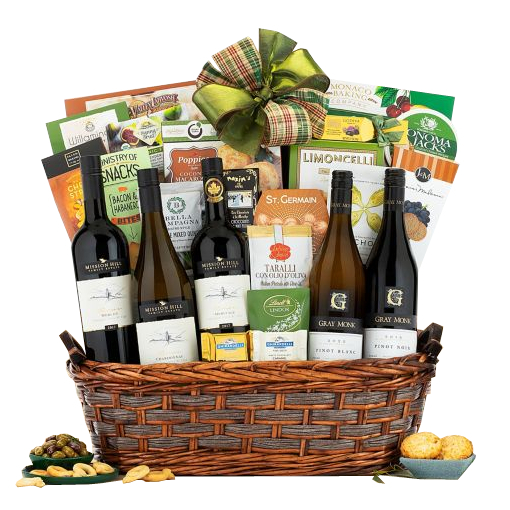 Show your friends and family why when you send them a gourmet wine gift set inspired by wine from the Okanagan Valley. Your friends will enjoy 5 bottles of wine (750 ml each), including a intense cherry and vanilla flavored Misson Hill Pendragon Cabernet Sauvignon, Wayne Gretzky Merlot and Chardonnay, Gray Monk Pinot Noir with notes of blackberries and rose petals and Gray Monk Pinot Gris with an aftertaste of fine herbs and citrus. They'll also enjoy an assortment of snacks like Mixed Olives (3.5oz), Smoked Salmon (2oz), Cocoa & Coconut Macaroons (2pc), Lily O'Brien's Vanilla Truffles (3pc), and more. Reward your office, surprise a new partner, or say Happy Birthday with Never A Crowd.